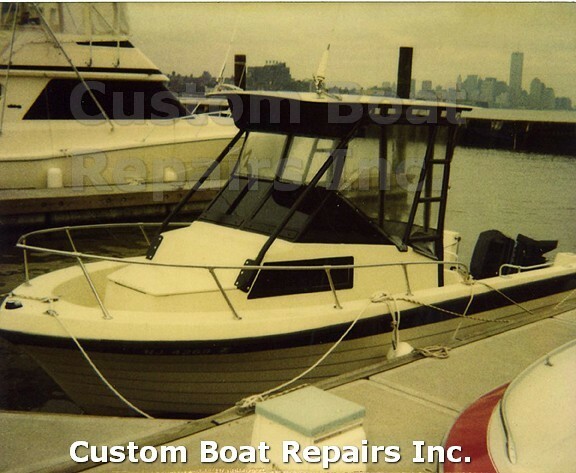 Custom Boat Repairs provides a variety of services and is always looking for a challenge. 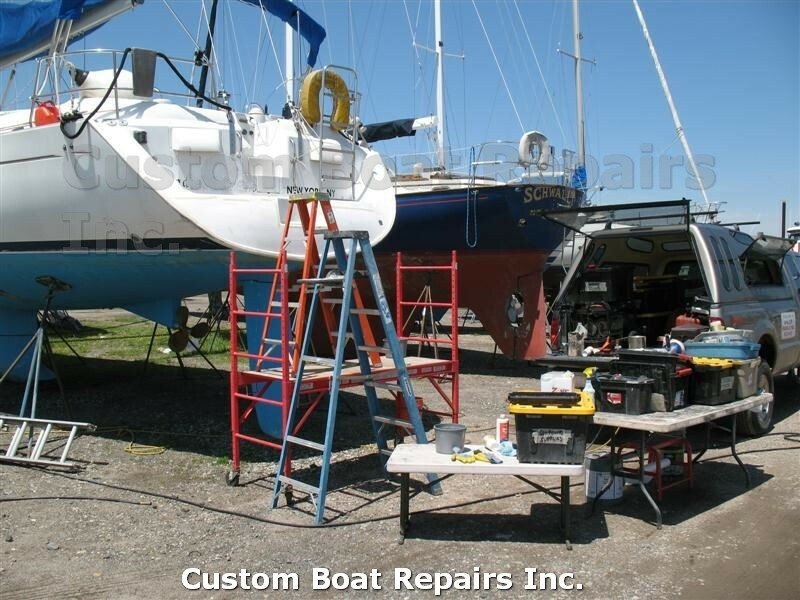 State of the art equipment paired with 45 years of experience guarantees that the work is done correctly the first time. 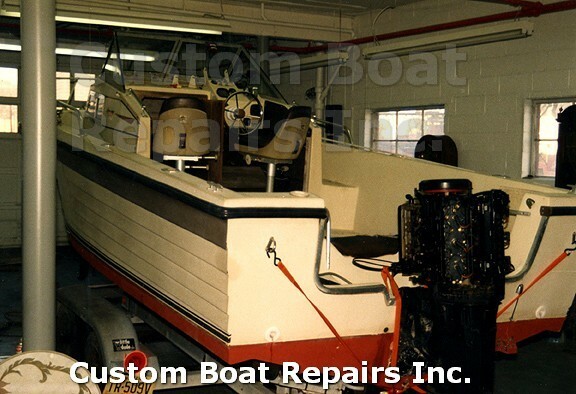 Bill Nowicki personally guarantees customer satisfaction in each and every project through the use of quality products, professional equipment and skilled workmanship. 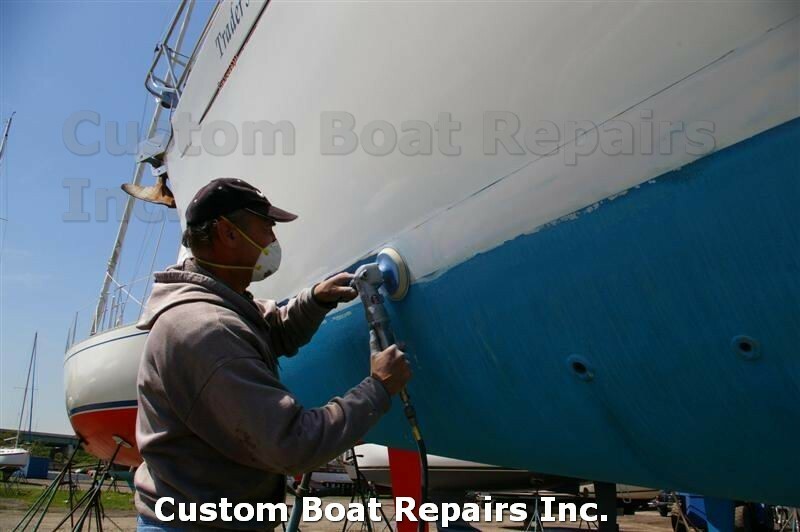 Scroll down to learn more about each service. 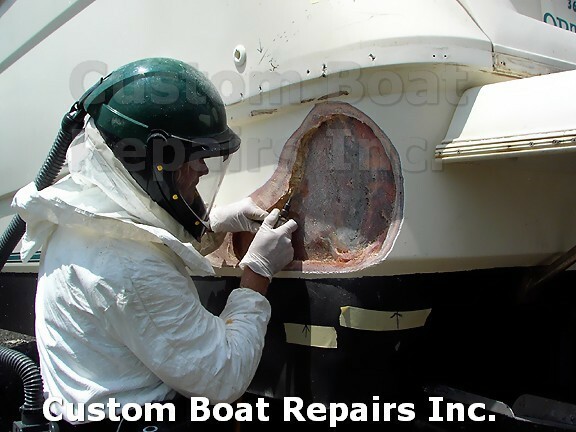 Custom Boat Repairs does fiberglass repairs the right way the first time. 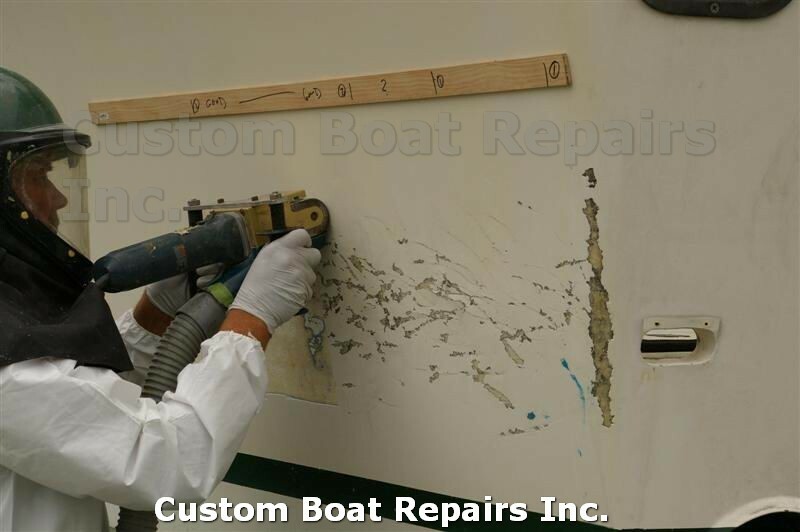 This process starts by enclosing the repair area to contain the spread of fiberglass particles and keeping it properly vented. 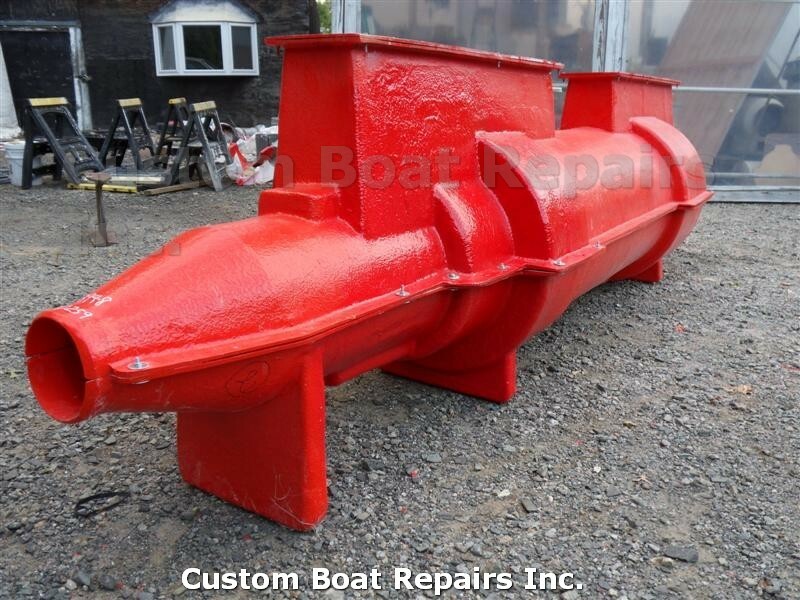 This is accomplished by using 2 ventilator blowers and a large air compressor, which are used to run all of the air tools such as grinders & carbide cutters. 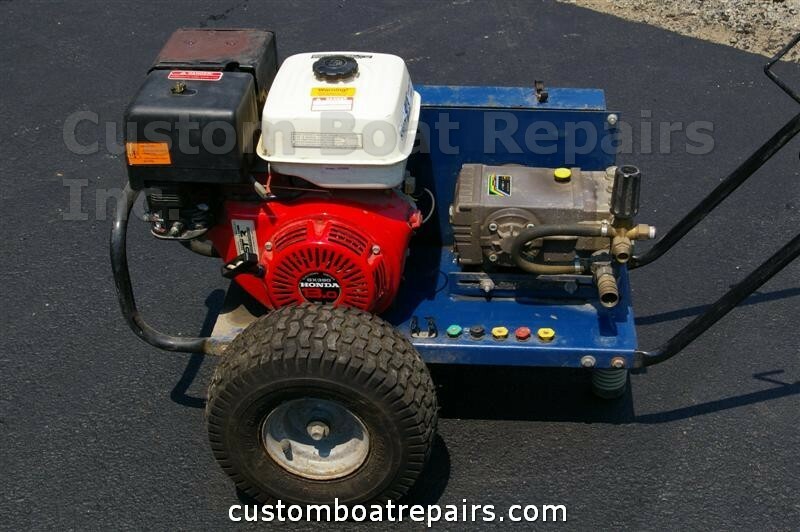 A Heavy-duty generator is used to run all equipment as boat yards do not usually have sufficient power out in the field to do this. 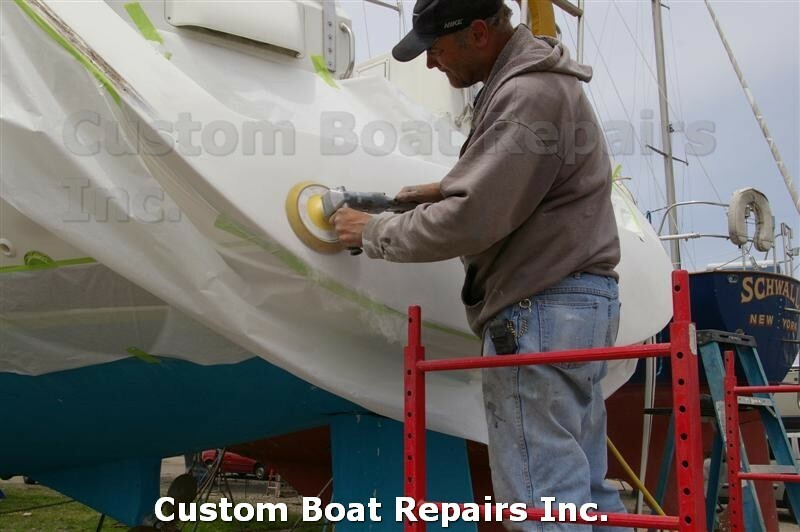 Quality resin like Polyester and Vinyl Ester are purchased separately and specifically for each job. 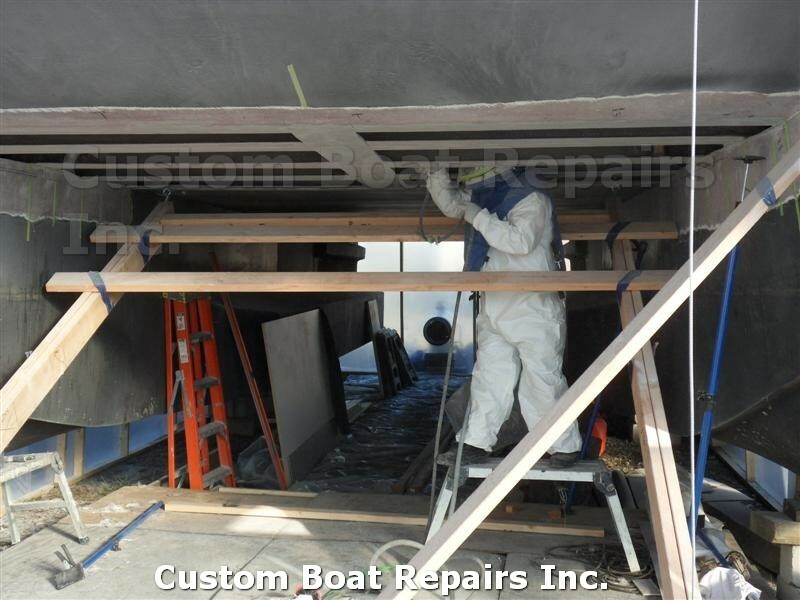 By using the Tyvek Suit and a self-contained breathing unit, Bill is able to give his full attention to the task at hand. 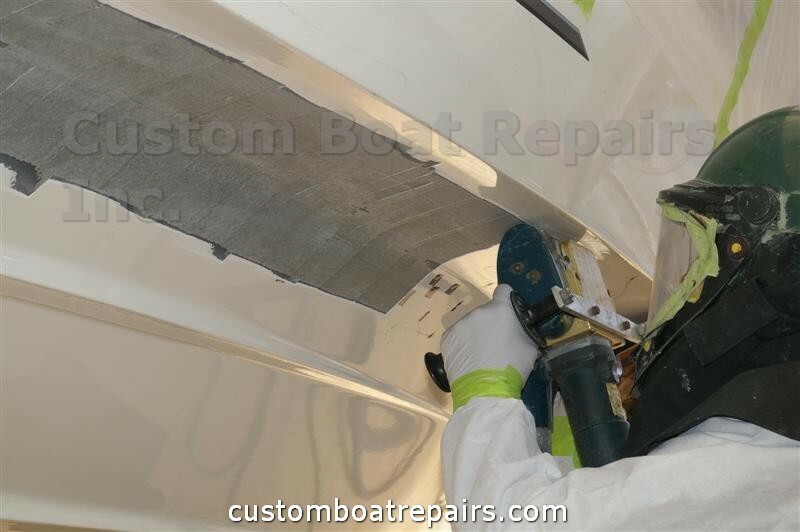 Engine Mounting Blocks, Stringers and Transoms are some of the first things that deteriorate on a boat hull especially when the fiberglass covering is penetrated by mounting screws & clamps. 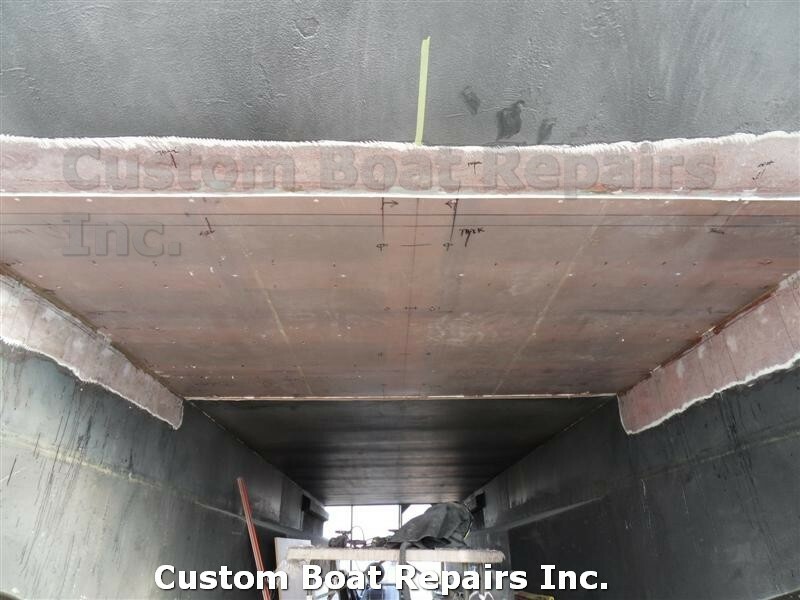 This and large holes in hulls can be repaired using new hi-tech resins and bi-ply fiberglass to make the hull stronger than the day it left the factory. 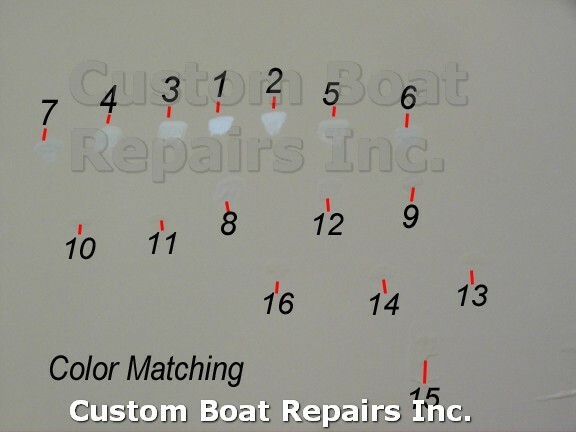 Custom Boat Repairs takes extreme pride in its expert color matching & blending techniques . 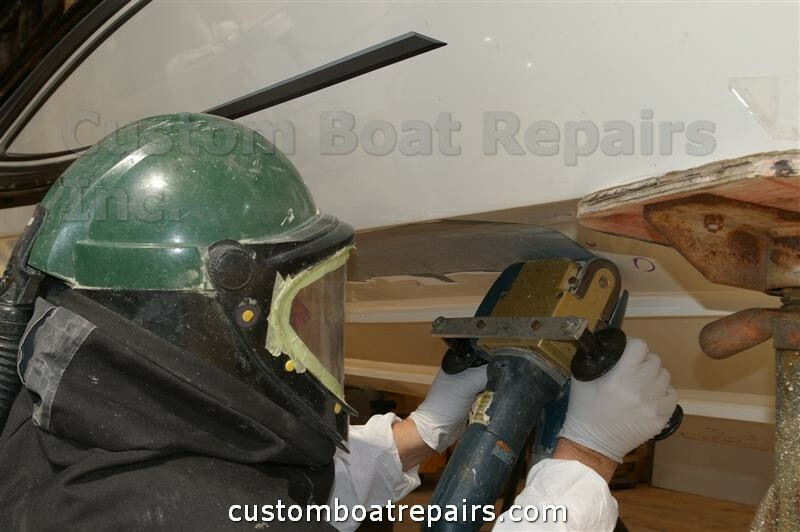 When the repair is completed it has a shiny mirror finish. 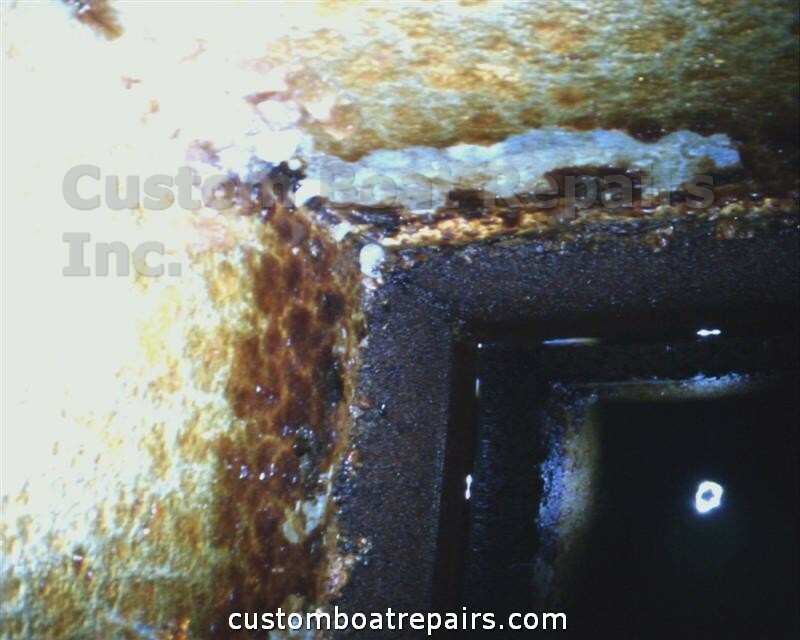 You will not see any dry Rings or tape lines like other repairmen leave. 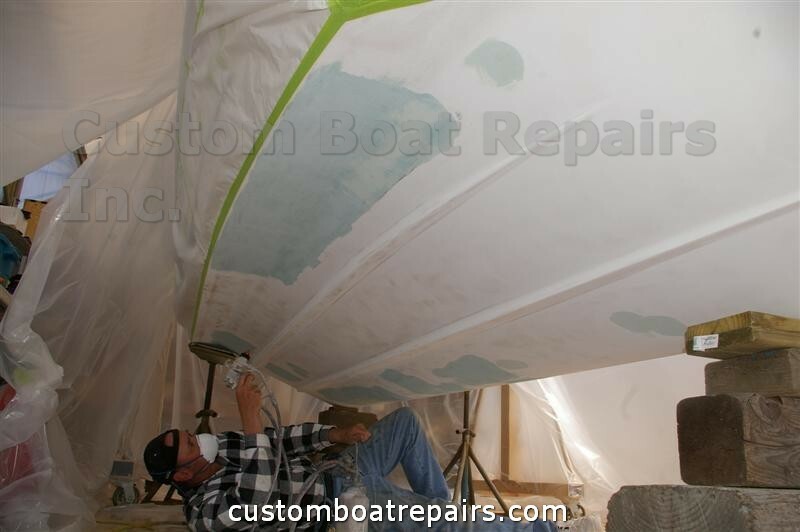 Customers approve the color match before the repairs begin. 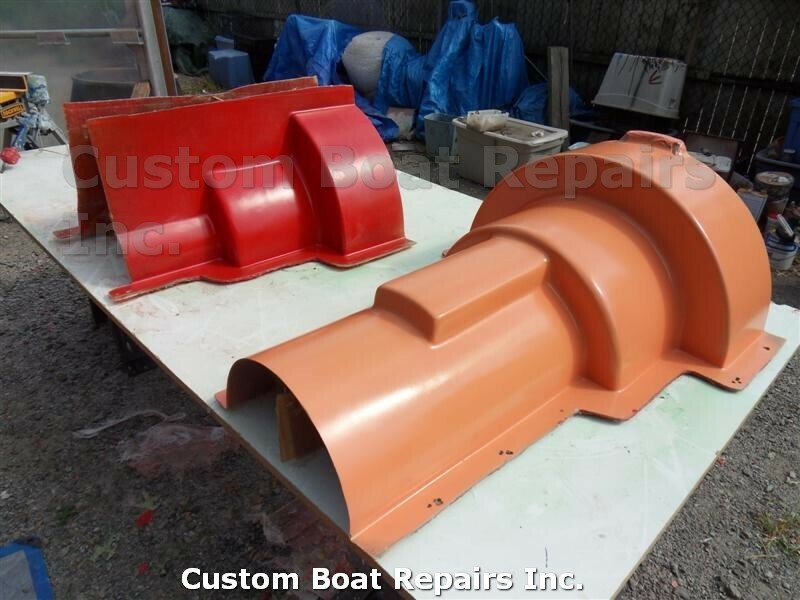 Great color matches can also be achieved on non-skid surfaces like the ones on swim platforms. 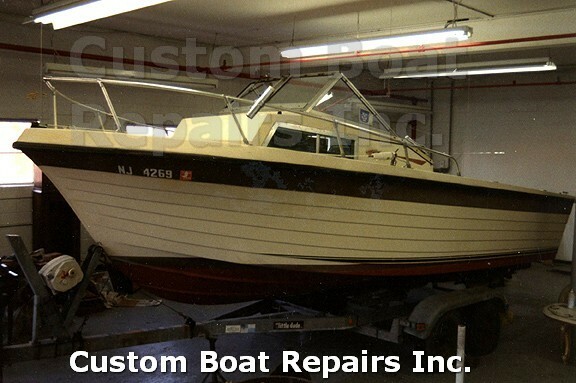 Custom Boat Repair is also available to handle Woodworking Services on items such as rub rails, and moldings. 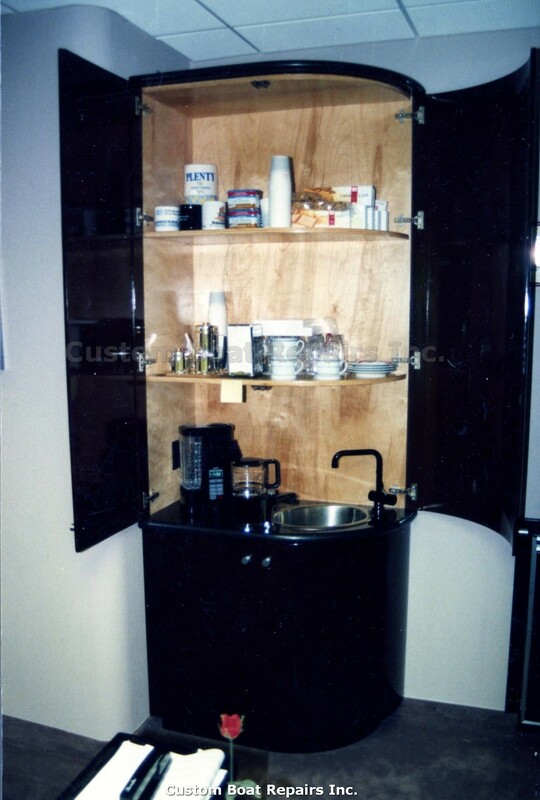 Building unique furniture for challenging spaces is another service. 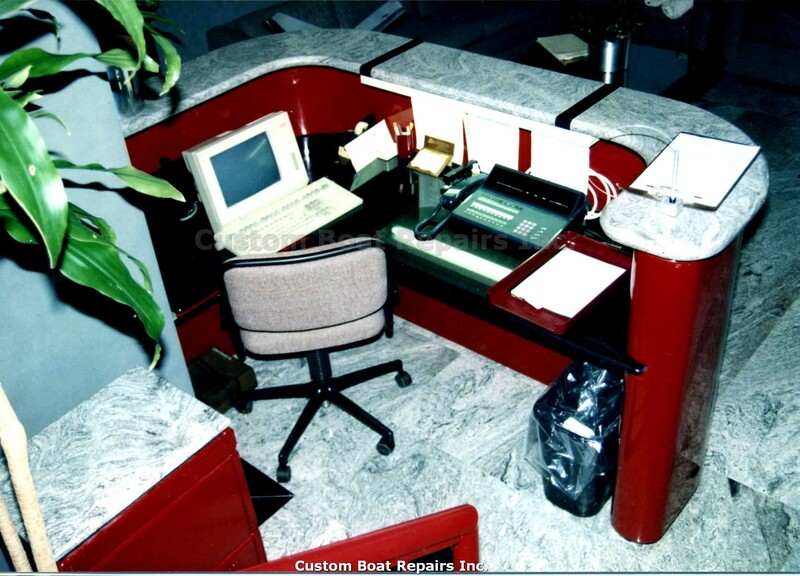 See how Custom Boat Repairs built a custom reception desk. 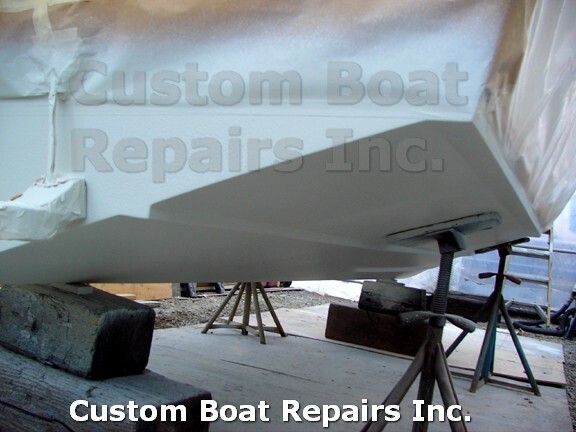 Aluminum skegs on outboard motors and outdrives can be welded and sprayed to match factory colors. 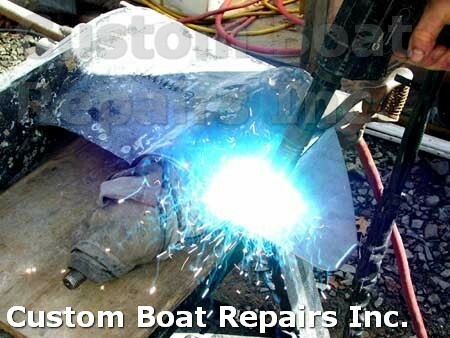 Aluminum T-Tops and Radio Boxes can also be fabricated. 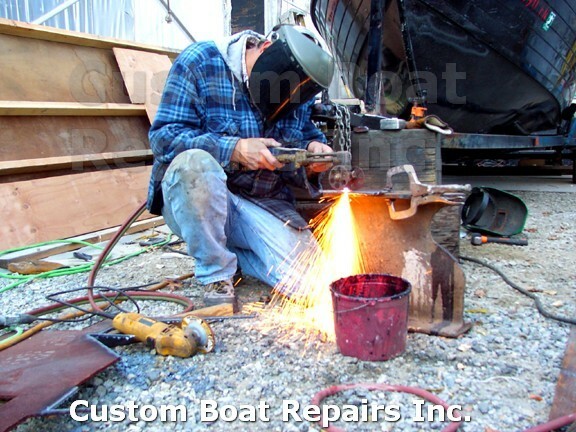 Another area of concentration is building Steel Tables with Granite Tops. 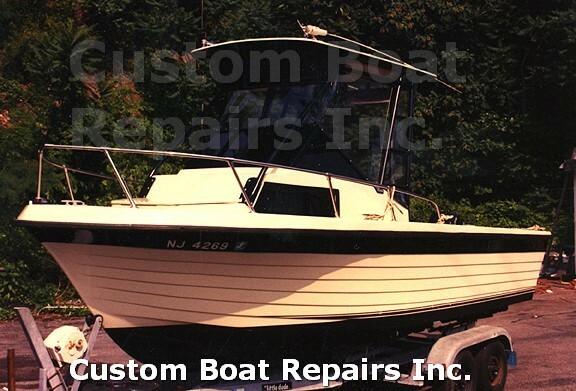 Custom Boat Repairs creates custom pieces built to your specifications. 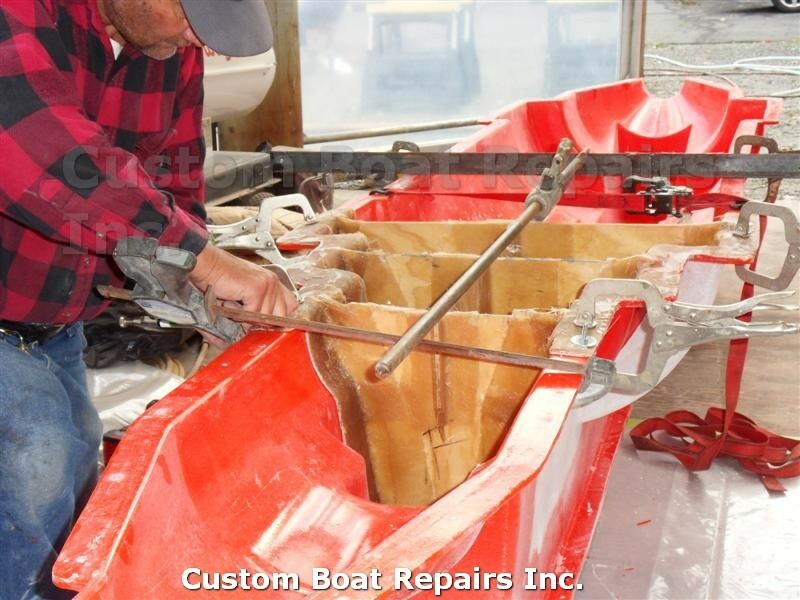 The challenge of modifying boats and successfully completing a variety of projects motivates Bill Nowicki. 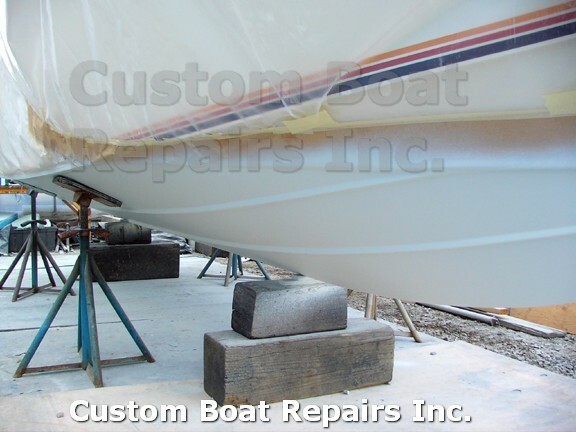 One example of a custom modification is a Dockrell Sail Boat that needed a reduction of motor noise and motor fumes. 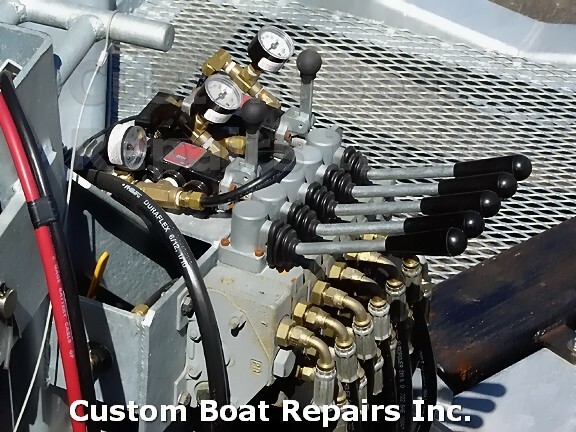 This modification included enclosing the engine with an insulated cover and replacing the Tiller Steering System with an Edson Pedestal Steering System. 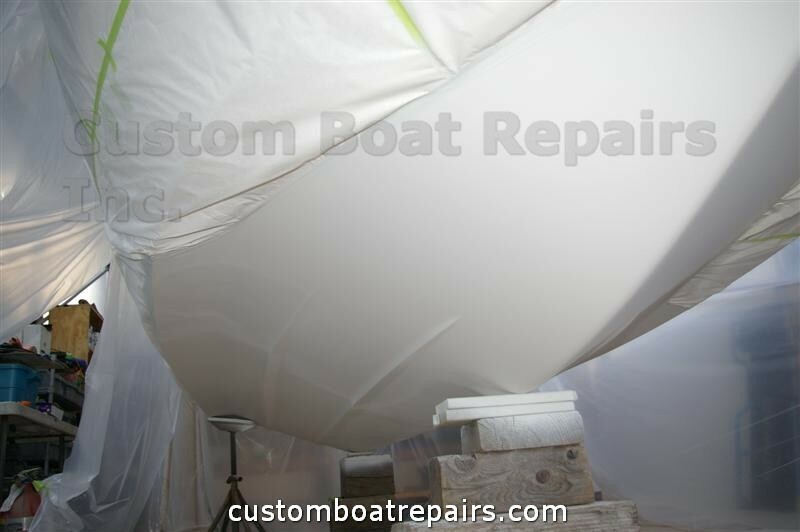 When the conversion was completed, the engine cover would be used for a seat while steering the sailboat. 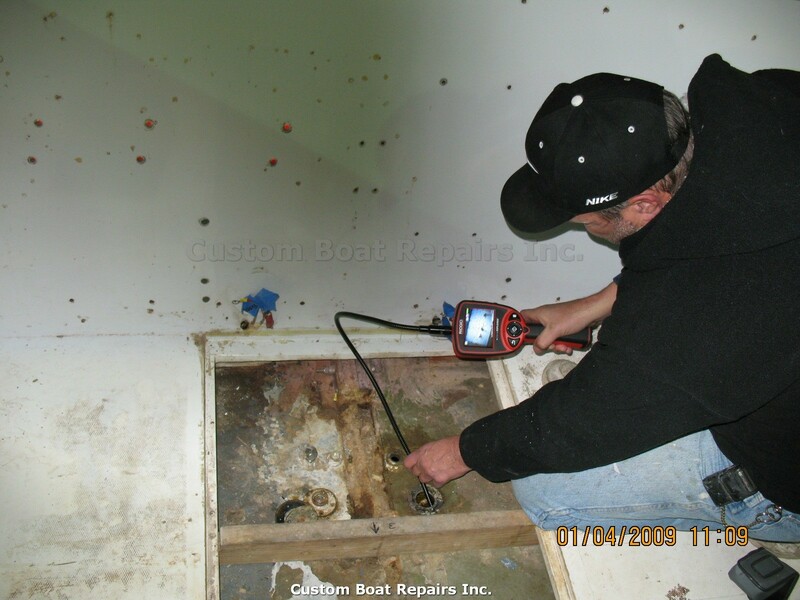 The engine was quiet, the fumes eliminated and the Edison Pedestal Steering System made sailing the boat enjoyable. 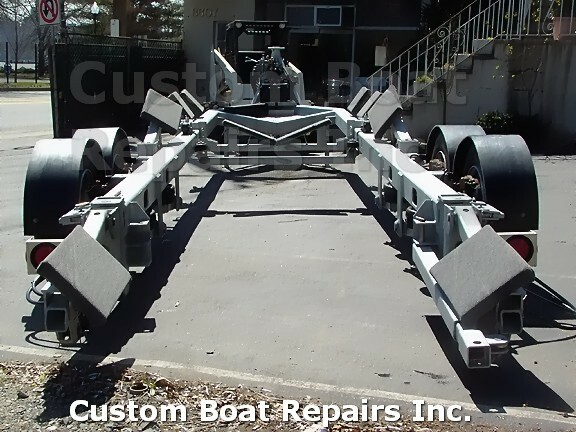 The colors were custom matched and the modifications look as if they were part of the original design . 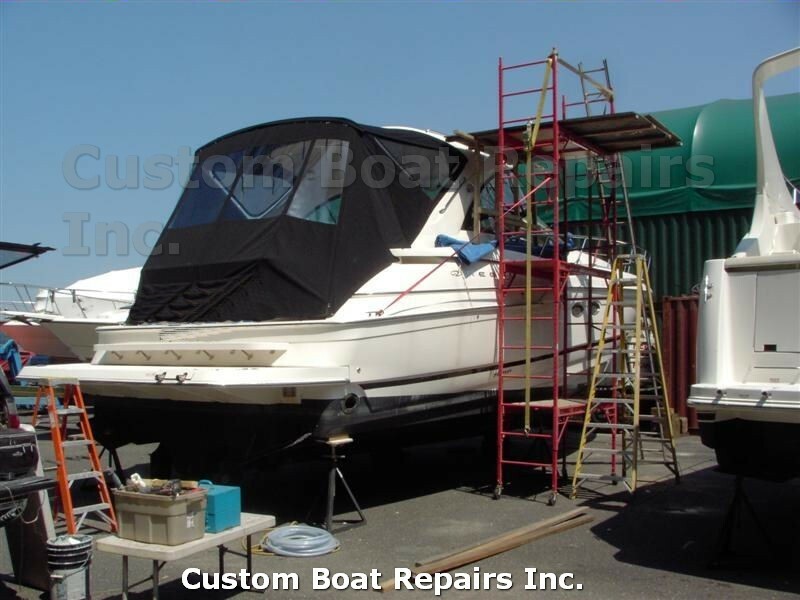 This is just one of many success stories. 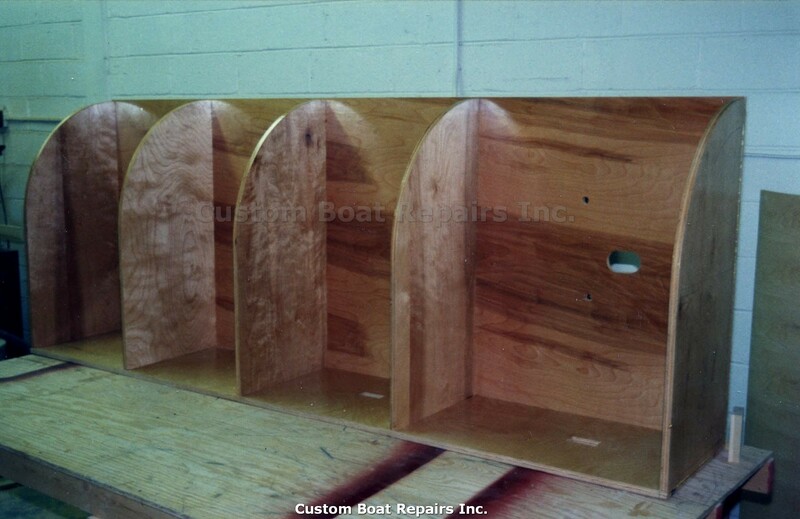 Another challenging project was molding a step for a boat manufacturer. 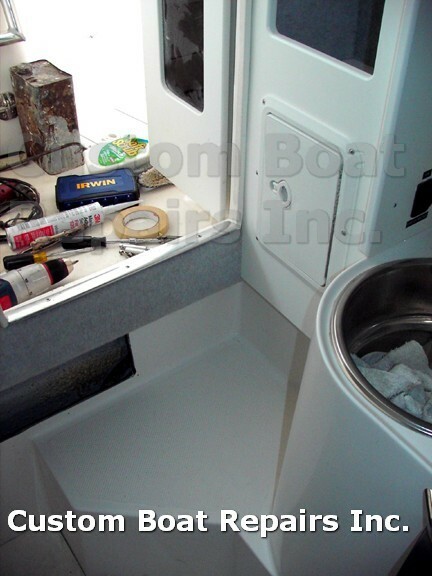 This step had to look like it belonged in the boat. 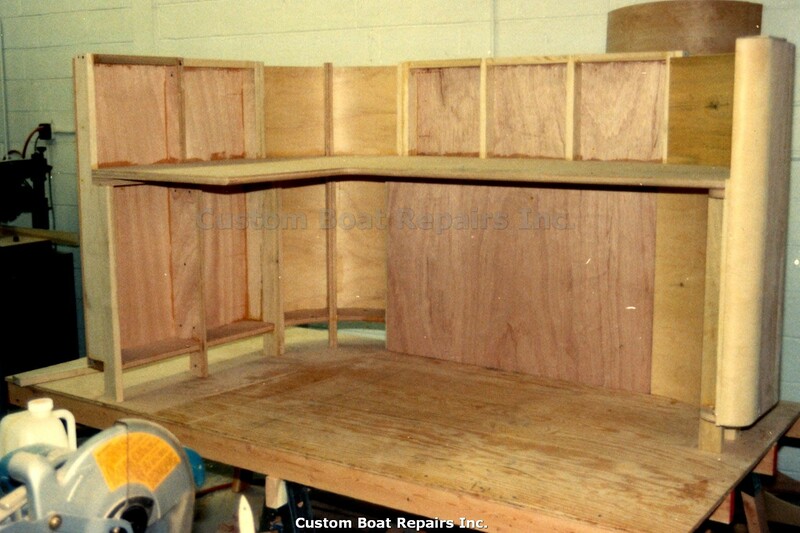 Here is another project. 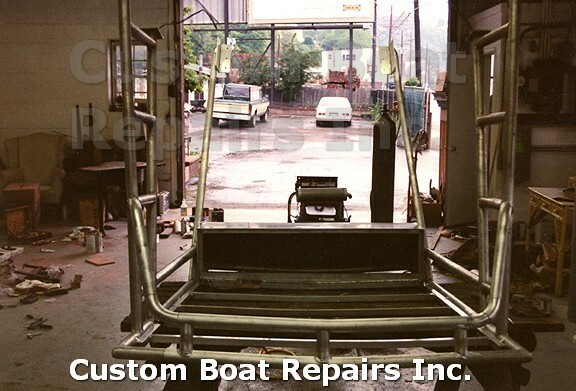 Prysmian Group I had to modified electrical tubes for transmissions lines running from NJ to NY. All of these projects and more were a complete success. 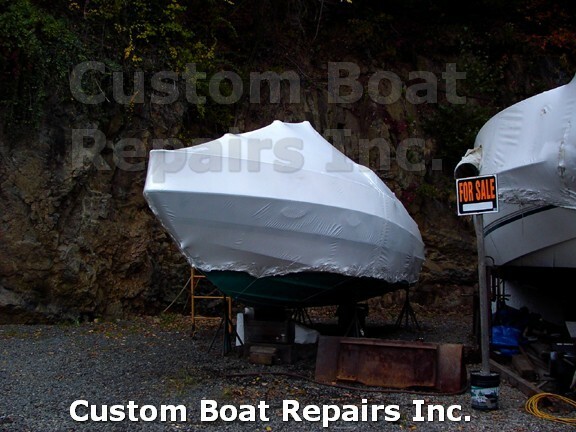 This is a very important step whether you are buying or repairing a boat. 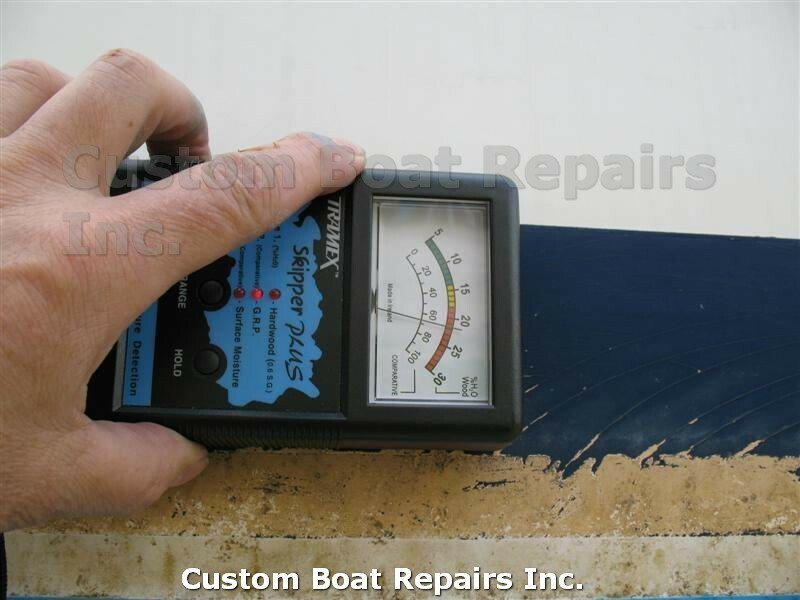 Custom Boat Repairs has the equipment that allows for quick and easy moisture detection. 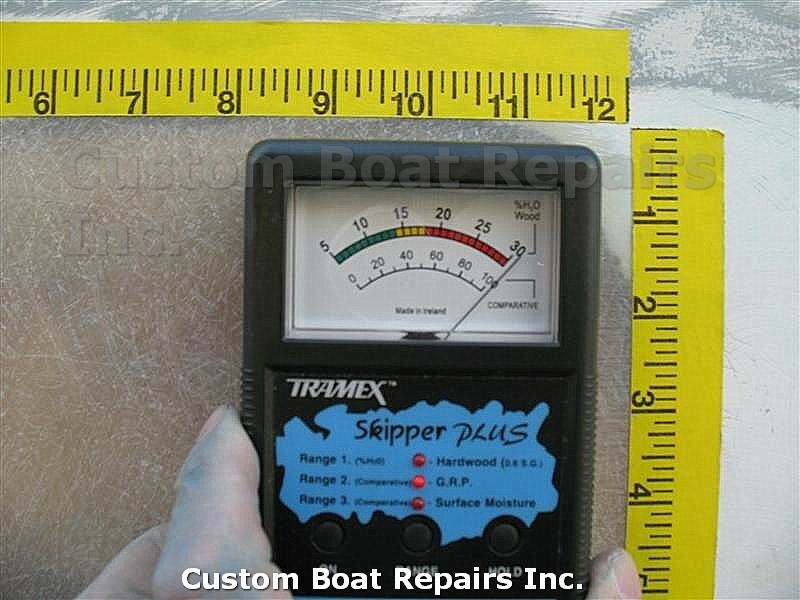 This is another great tool in my arsenal to locate cracks in fiberglass hulls without cutting open the area to inspect it. 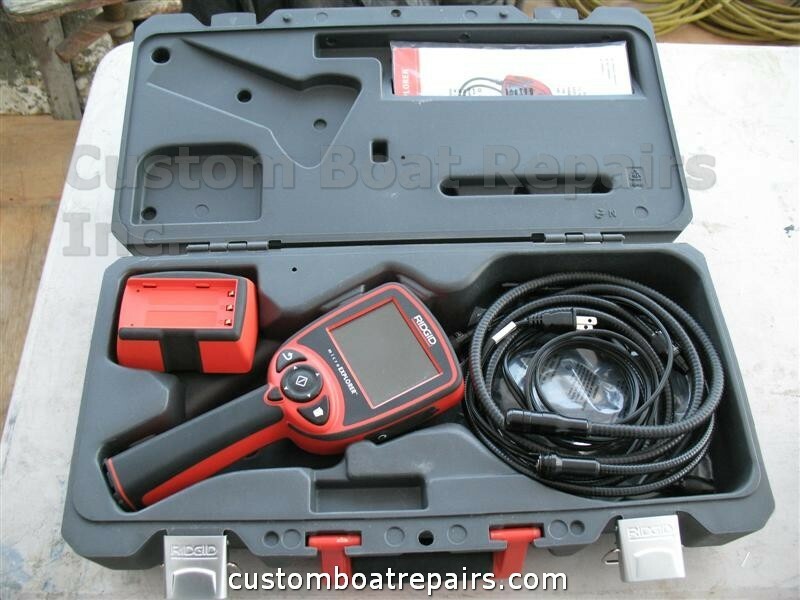 This tool has a 1/4" flexible shaft that starts at 3ft and I can extend it to12ft long, with a camera and a light on the end of it to lite up dark cavities in the boat. 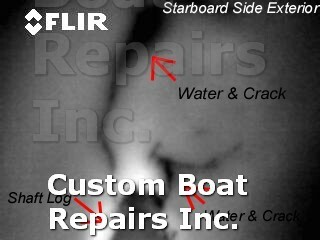 I can take still photos & video of the areas that are inaccessible to the human eye. 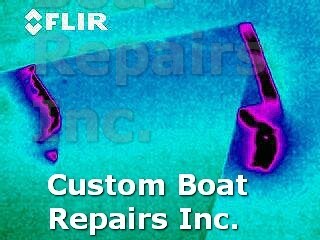 Custom Boat Repair utilizes an Infrared camera to inspect fiberglass boat hulls. 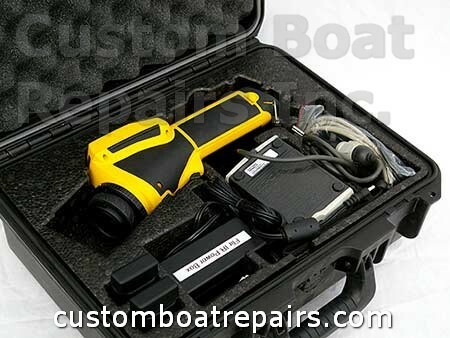 This camera detects damage that the human eye cannot see. 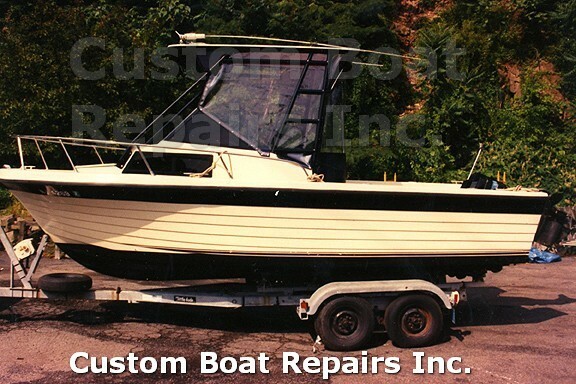 To learn more about this click on the link. 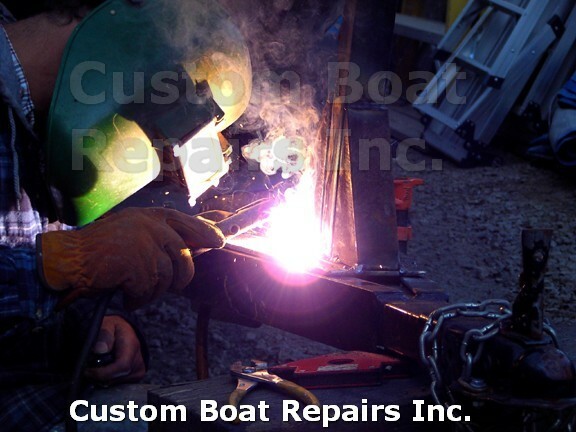 Custom Boat Repair provides complete mobile yacht service. 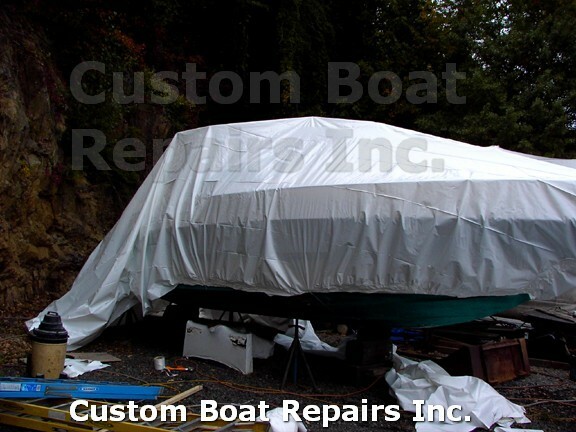 Shrink-wrapping services are available for boats and anything else that needs to be protected from the weather. 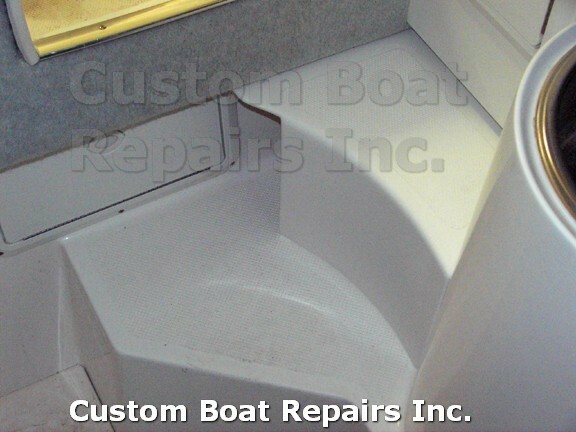 Custom Boat Repair can also make special fiberglass parts. 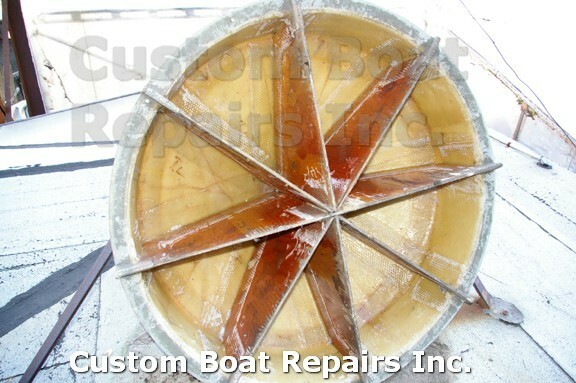 Molds are created so that as many fiberglass parts as needed can be cast. 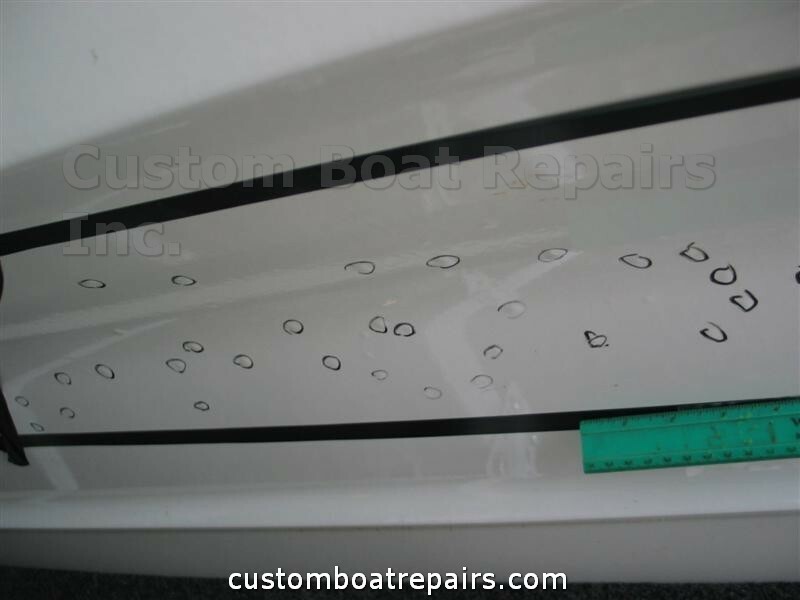 One example is when , WOR-TV, who needed microwave dish covers for their microwave antennas contacted Custom Boat Repair. 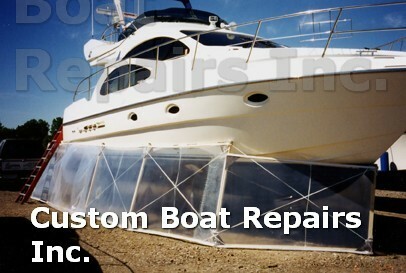 These covers were used to protect the antennas from the falling ice. 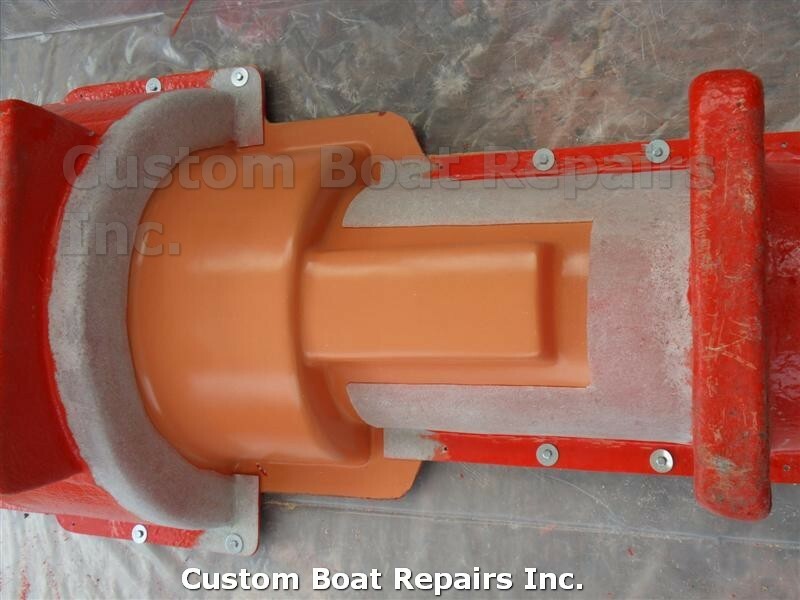 A mold was made so that the covers could be quickly cast. 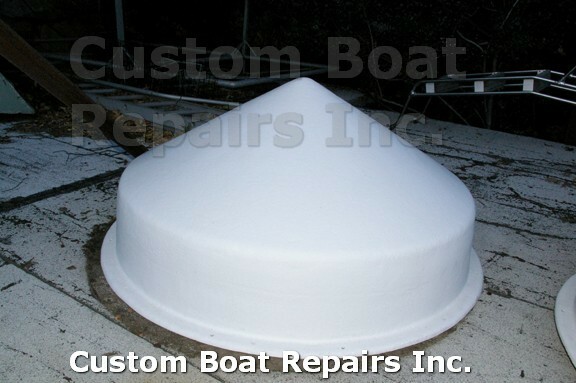 Unlike the original covers, these fiberglass covers were able to protect the antennas from the ice for several years. 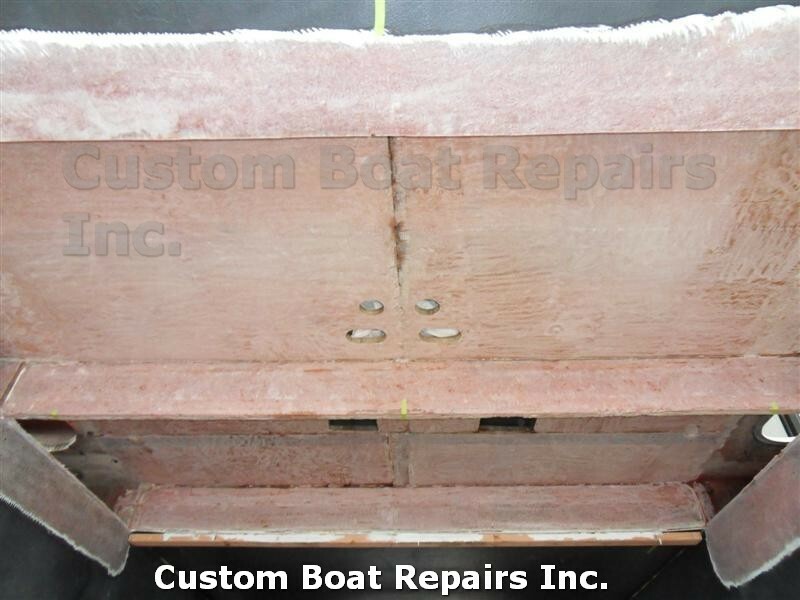 Another project was to make fiberglass molds for a company called Prysmian Group. 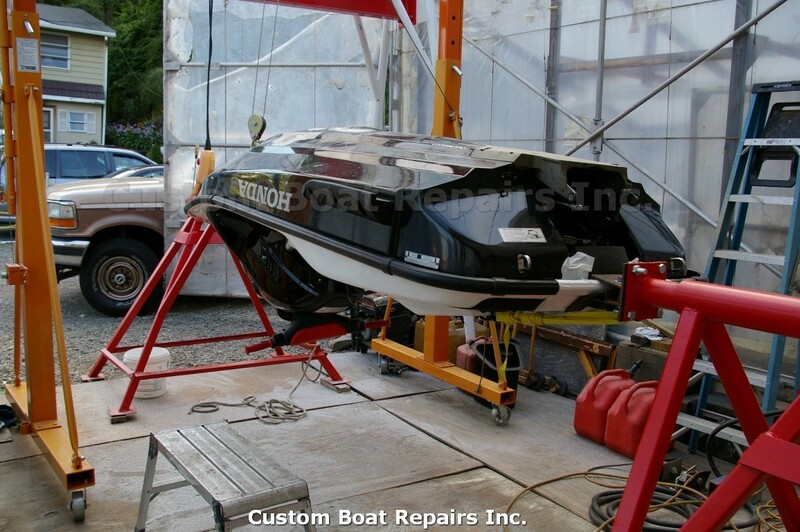 You can read all about it in the repair section of this website. 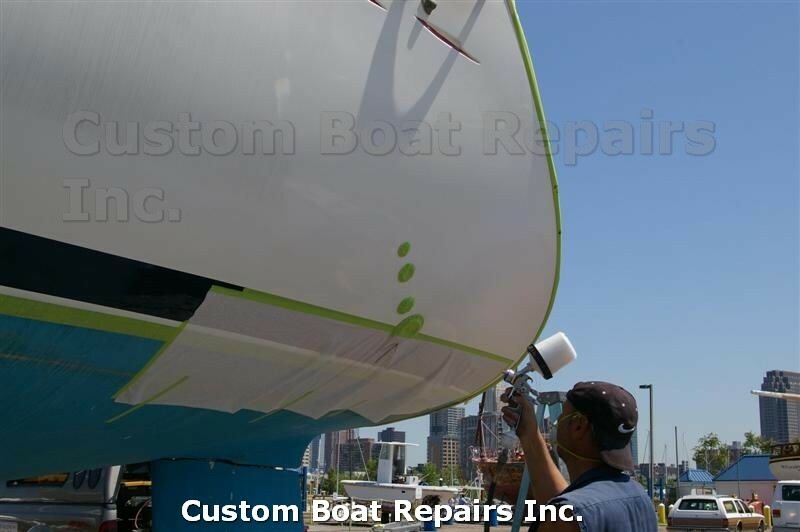 Gel-stripping is accomplished by using special carbide cutters and removing the blister gel-coat. 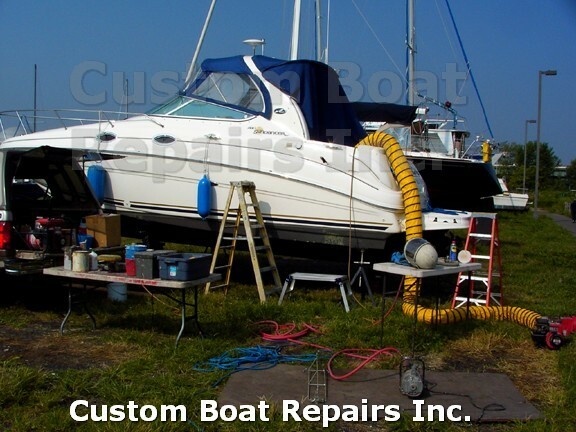 The area is then Pressure washed and Barrier Coated. 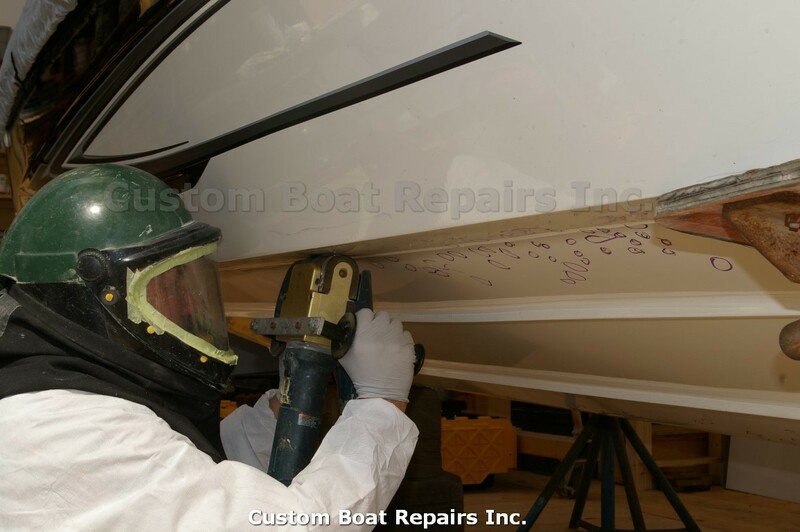 Special Barrier coatings are applied to the bottom of boats to stop Osmosis Blistering. 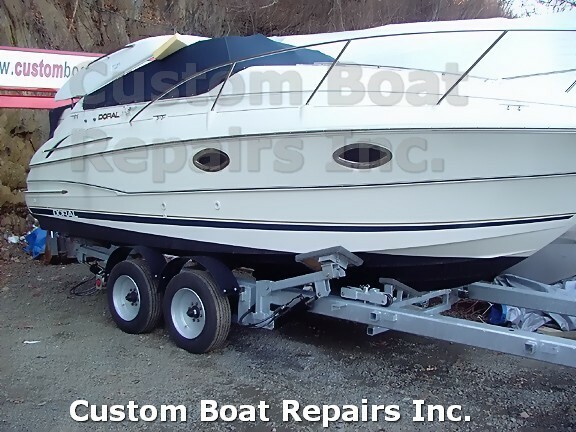 Custom Boat Repair owns an 18,000 Lbs Hydraulic Trailer with and air ride suspension system. 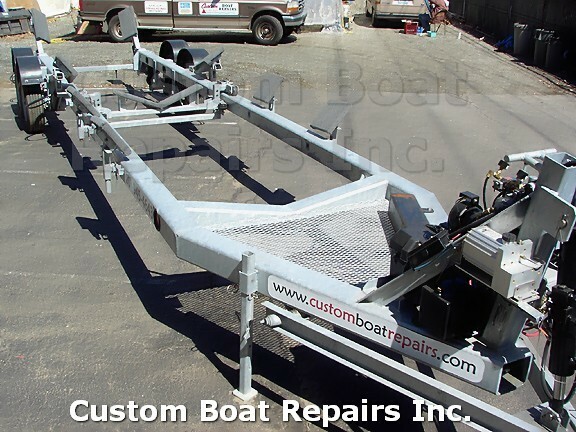 This system is very safe for towing boats. 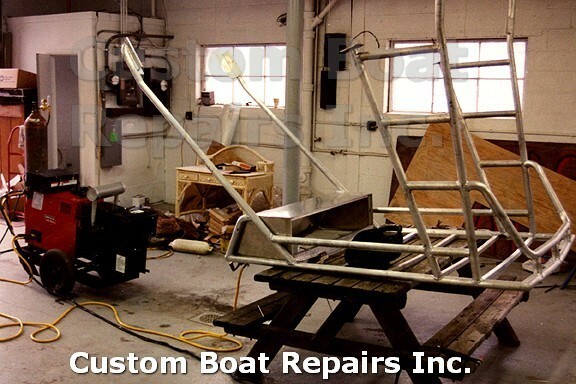 Bill also creates custom hardtops for boats and can make anything else out of aluminum. 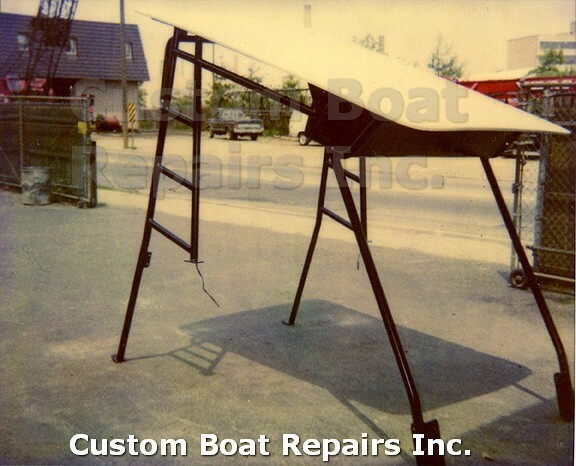 After welding his own aluminum shelter with shrink-wrap, many customers were interested in having one built so they could utilize it as a green house. 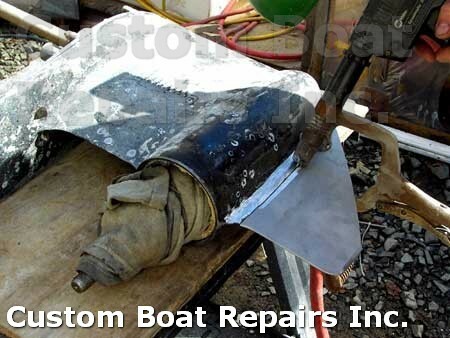 Custom Boat Repair has built a special device to repair Jet Skis. 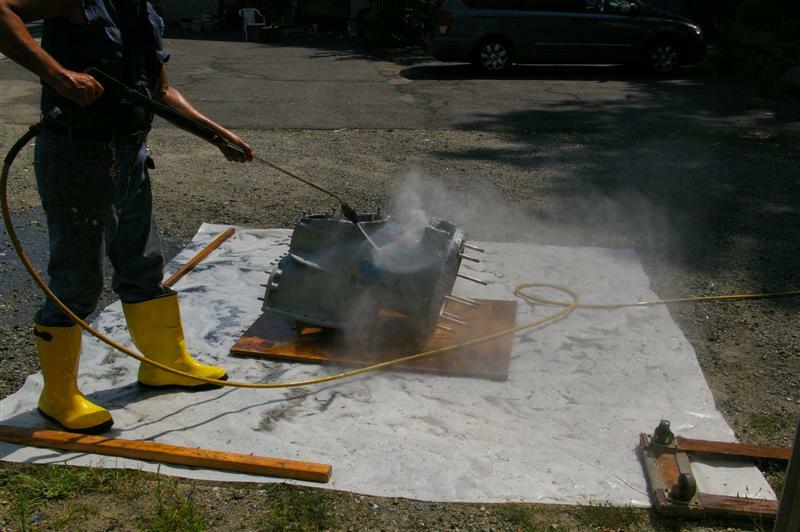 This device is called the rotisserie. 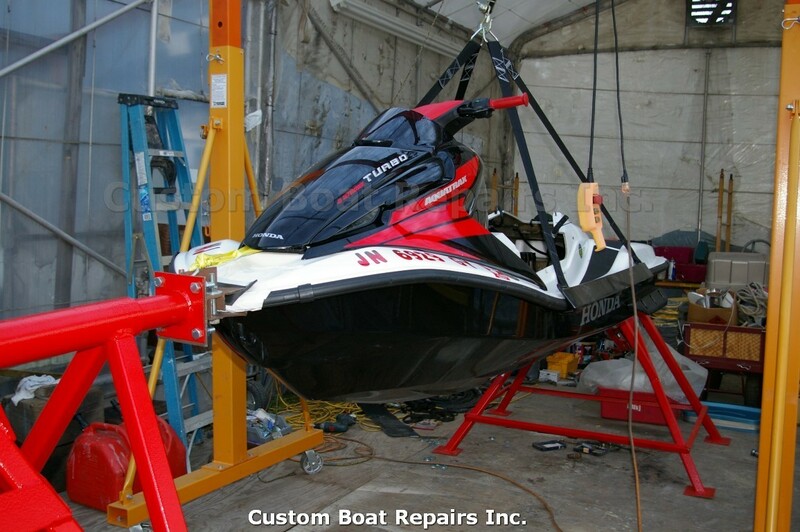 Jet skis are mounted into the rotisserie and then are able to be rotated to any side that needs to be worked on. 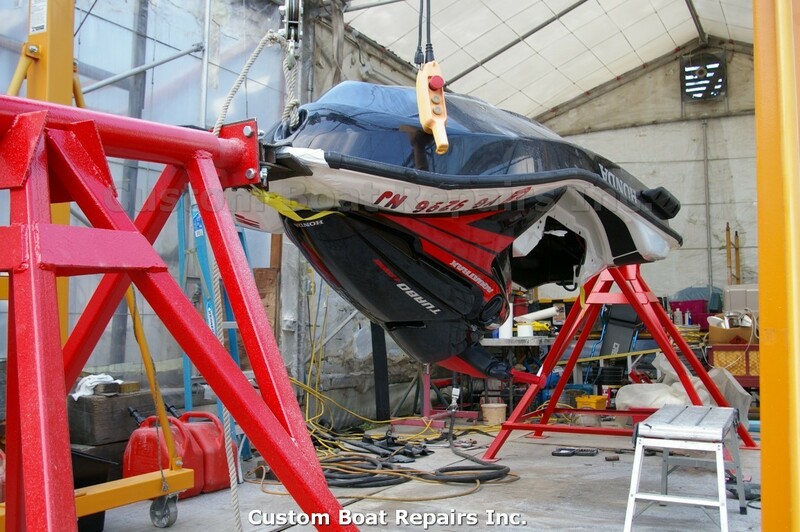 This allows for jet skis to be repaired quickly and efficiently. 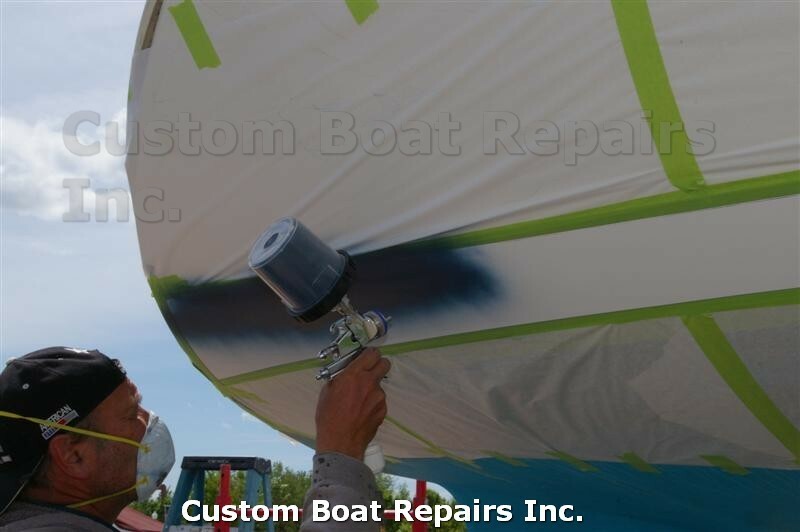 Heavy-duty 4000psi pressure cleaners with laser nozzles are used to rip off bottom paint without any damage to the gel coat. 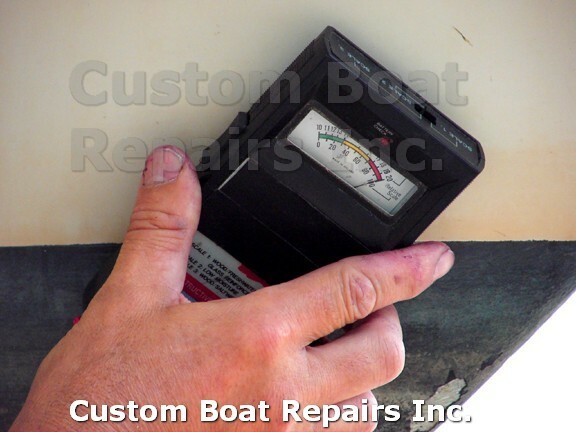 Verbal Estimates can be given for free in the local area. 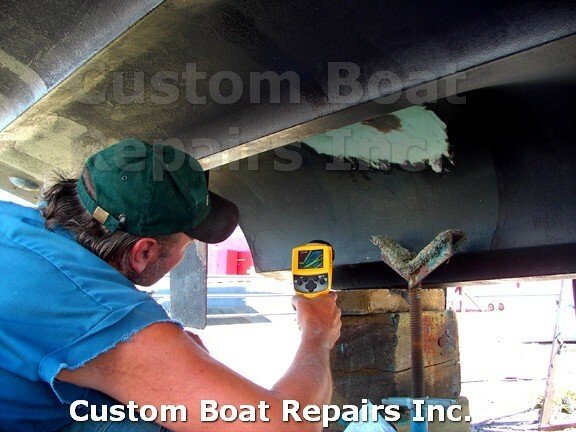 There will be a charge for written insurance estimates. 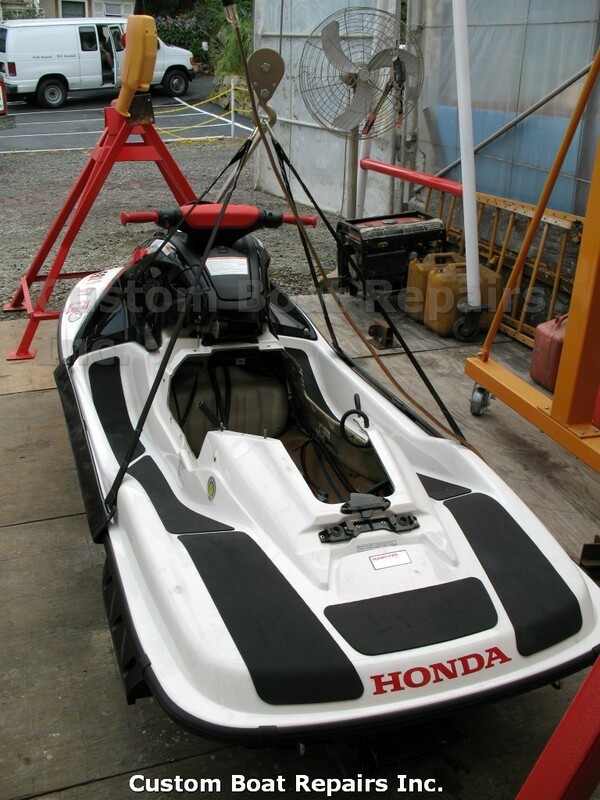 This cost will be deducted from the job. 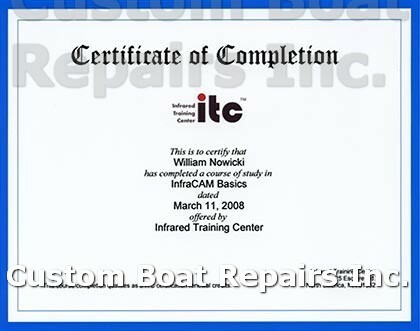 Free second opinions can be done in the local area. 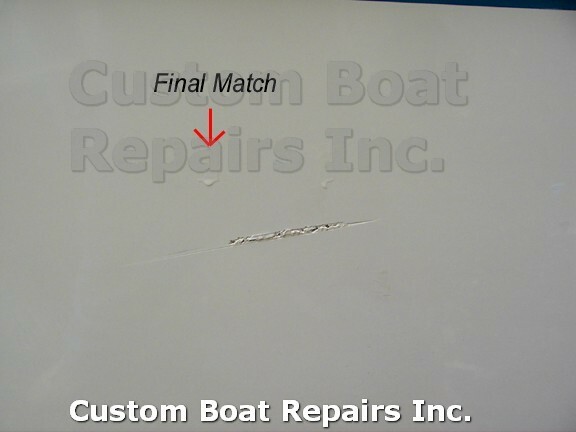 If you are not local, you can E-mail digital pictures and Custom Boat Repair can check out the damage. 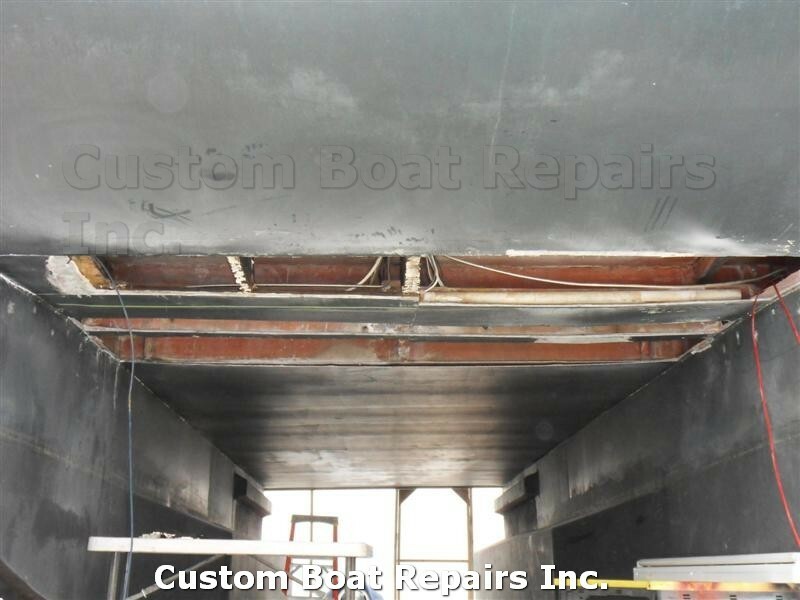 Phone or E-mail Custom Boat with questions about repairs you are presently having done, and a second opinion or consultation can be given. 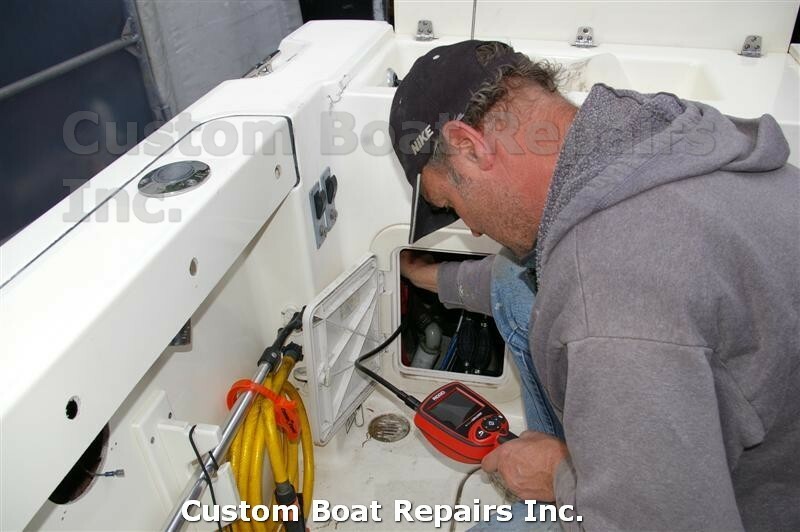 Example of Free Service.